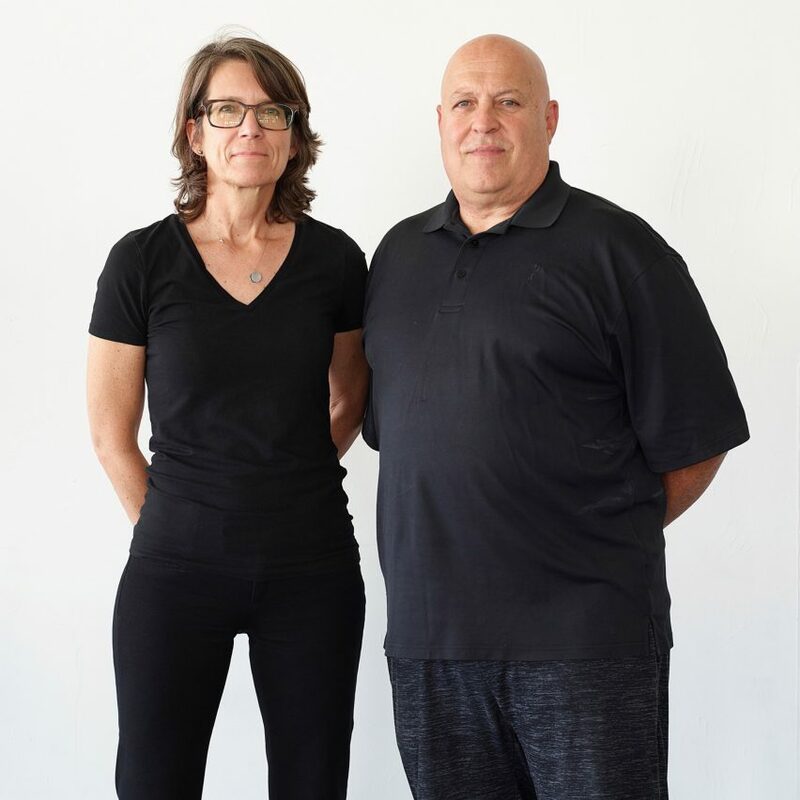 Brooks + Scarpa principals Angela Brooks and Larry Scarpa explain their concept for a public pavilion that could harness energy from lightning in our penultimate P.O.D.System Architecture movie. Los Angeles- and Florida-based architecture studio Brooks + Scarpa has created a conceptual energy-harvesting pavilion for P.O.D.System Architecture – a collaboration between Dezeen and adidas Originals. 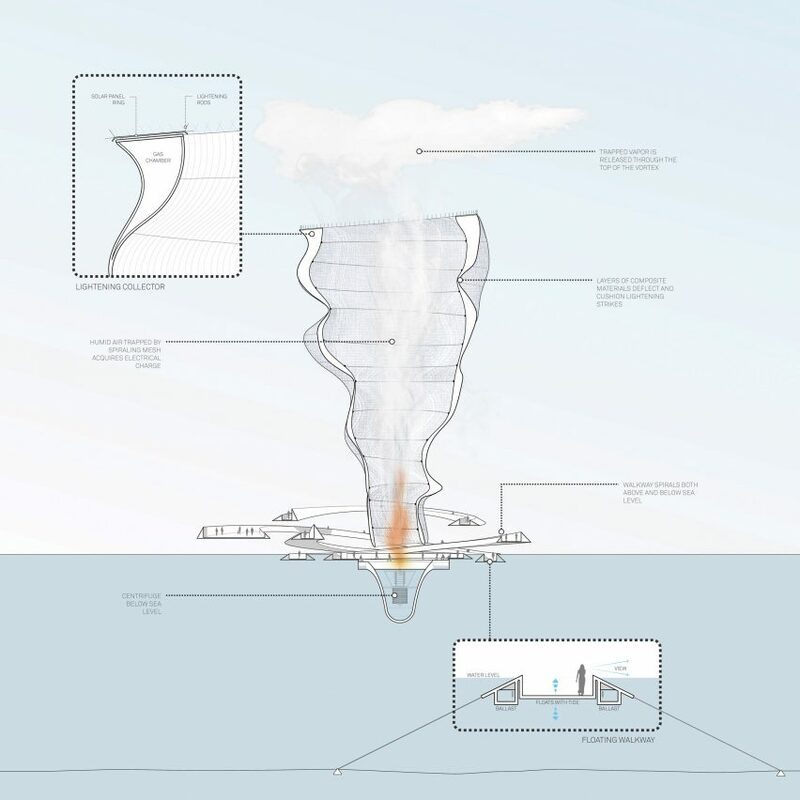 Called Vortex Generator, Brooks + Scarpa’s proposed structure merges a public pavilion with a renewable energy power plant, and is intended to capture energy from the sun as well as lightning storms. The P.O.D.System Architecture project calls on Los Angeles-based architects to create conceptual buildings based on the story behind adidas’ recently launched P.O.D.System shoe, which combines three different shock-absorbing technologies into a single sneaker. “We wanted our building to relate to adidas’ tagline for the P.O.D.System shoe: Great alone, better together,” Brooks explains in the movie, which Dezeen filmed in Los Angeles. 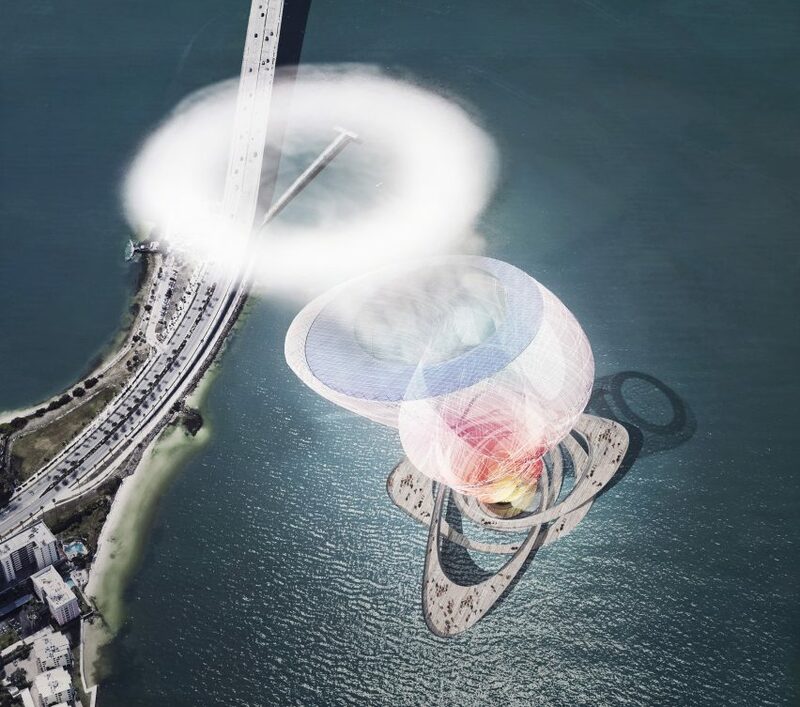 Envisioned for Sarasota Bay, Florida, where hot sun and intense lightning storms are commonplace, the conceptual pavilion features a huge, spiralling, gas-filled structure in the centre, made from a flexible, conductive mesh material. The top of this structure features a ring of solar panels to capture energy from the sun, as well as an array of lightning rods. 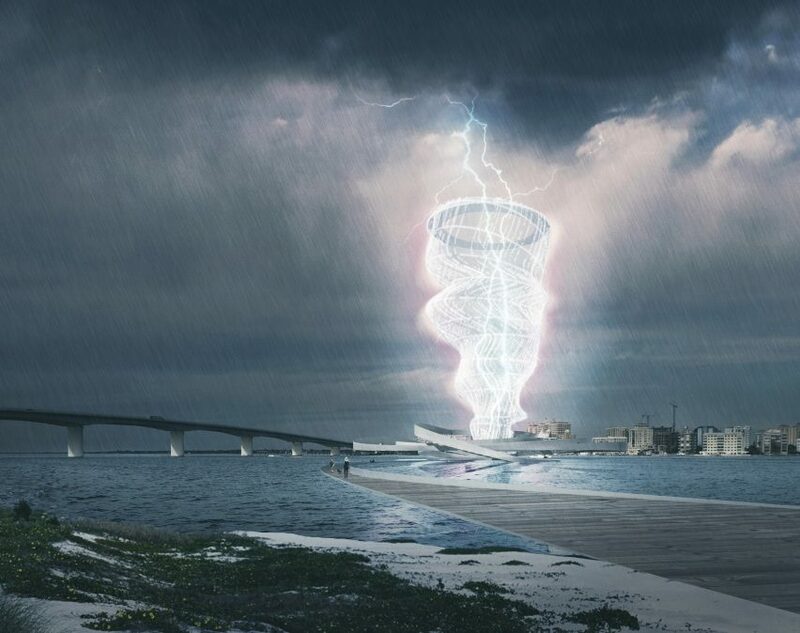 The funnel-like pavilion inflates when a storm approaches, rising up to attract lightning strikes, which it directs to the electrical substation below. 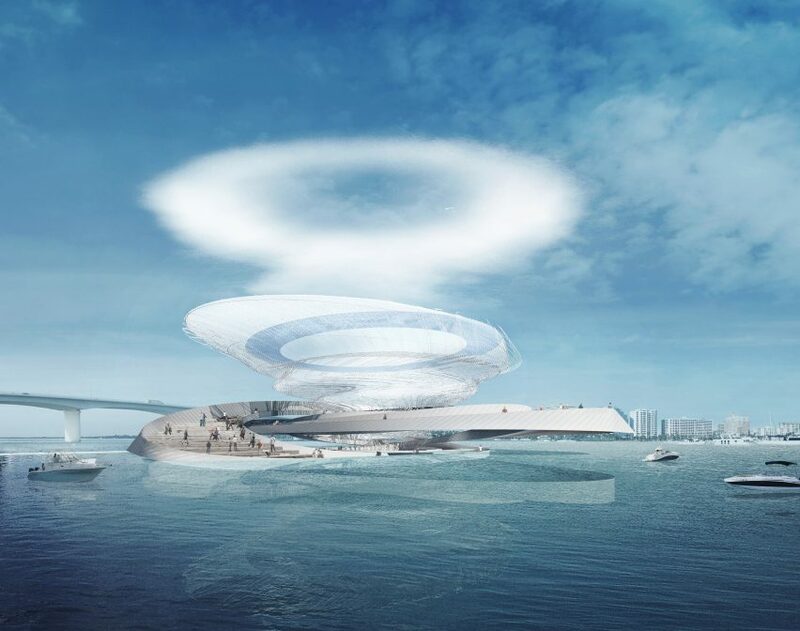 Vortex Generator would be accessible to the public via a walled walkway set below the water level of the bay, which rises up out of the water and spirals around the base of the inflatable structure. The central portion acts like a giant lightning rod, ensuring that no-one on the path would be struck by lightning in a storm. 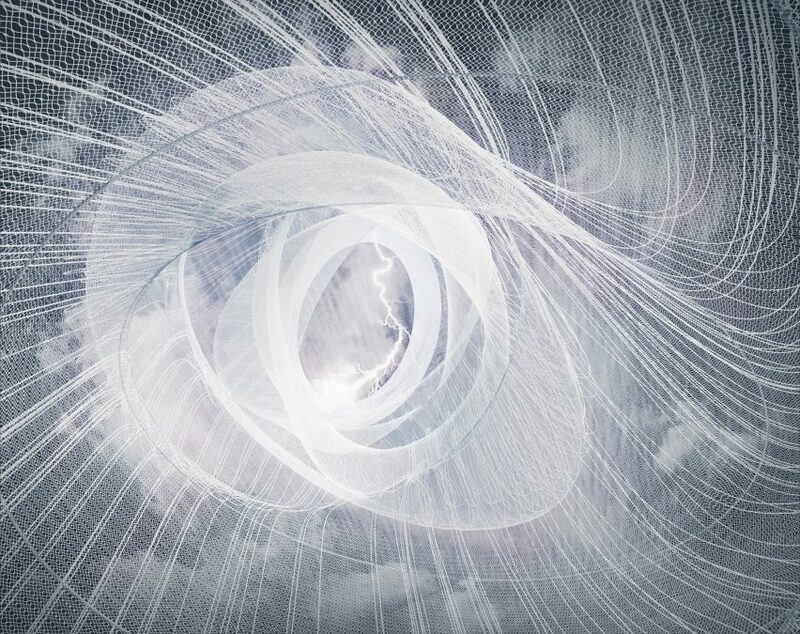 As well as capturing electricity from the storm, Brooks and Scarpa imagine that Vortex Generator would also create a show for people watching. It is not currently possible to harvest electricity from lightning. Brooks and Scarpa admit that they do not know exactly what material the mesh structure would be made of, or how the electrical charge of the lightning strikes would be converted into useable energy. But they hope that the design will inspire people to consider what the future possibilities of a new renewable energy source could be. “The power of lightning is a very difficult thing to harness, but we have hope that someday it can happen,” Scarpa says. This movie was filmed by Dezeen in Los Angeles. It is the fourth of five videos as part of the P.O.D.System Architecture collaboration between Dezeen and adidas Originals. Previous videos in the series feature building concepts designed by fellow Los Angeles-based architecture firms Neil M Denari Architects, Design, Bitchesand Standard Architecture, while the final film will reveal a design by Bureau Spectacular.